One of the crazy things about living in Los Angeles is that the tiniest bit of rain sets the news media off on a frenzy. The rain gets it's own theme song and animated graphics and a name like "Storm Watch 2008" or "Weather Tracker 911" while a serious news anchor tosses it off to some woman on the street dressed to the nines in trendy rain apparel showing that yes indeed, there is some precipitation happening in the desert of L.A. I don't know why I find this so amusing, but I can't help laughing out loud at the very serious news reports surrounding our "weather events". It doesn't happen all that often, so I guess they have to make the most of it, right? No school today, so the boys colored and cut and taped and created elaborate Transformer action figures out of copy paper while I made apple pies, pumpkin bread, a Jello concoction, and cooked a fancy Moroccan Pork dinner (because tomorrow it's all about the turkey!). At one point, Benjamin realized that it was raining and ran to put on his boots and grab his umbrella and begged to go outside. He was so cute, I couldn't say no! 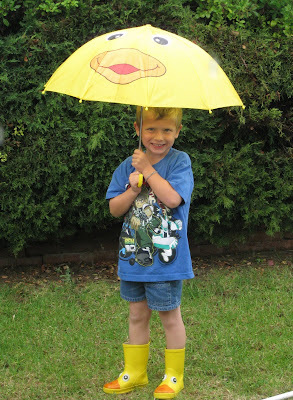 He wandered around, listening to the sound of the rain on his umbrella and the sound his boots made in the soggy grass. When the rain finally slowed, and then stopped completely, Ben decided to come back in. I was surprised and tried to encourage him to stay outside now that it was sunny and bright. No thanks, he said, it isn't fun unless it's raining. Aha. Ben is the only one in our little family that isn't a native Southern Californian... he was born in the San Francisco Bay area, which is cold and rainy and nothing like the temperate climate we currently enjoy. Unlike the rest of us, he doesn't mind being chilly. Silly boy.